"Happy Days" is not a perfect show. The plot centres around the efforts to save local diner "Arnold's" from demolition. Throw in a love story and we're off and away. Creator of the original television series, Garry Marshall, has written a script that is perky and fun and which certainly appears to have captured the spirit of the television show. An energetic opening number called "Welcome To Wisconsin" sets the tone but Act I loses momentum and is somewhat slack in its middle where it feels that it is left to Williams' songs and the cast to pick up the energy. It picks up towards the end of the act but one is left feeling that the script needs work in places. Act II, however, is a total gear change and full throttle is finally achieved from the get-go: It becomes supremely energetic, lively and much funnier. The pace is vastly improved and it speeds along perfectly. Throughout the script there are clear references to the original television show and also ironic references to the 1950s and 60s. This is a script written by a writer whose tongue is often firmly within his cheek. The "Fonzie"/"Pinky" love story is a little unsatisfying, however, and is somewhat glossed over. 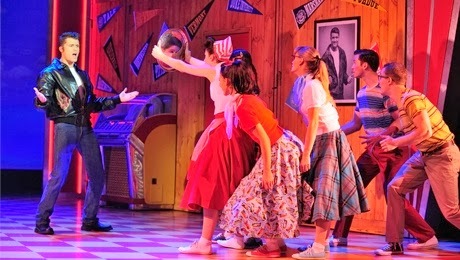 Paul Williams' music and lyrics are near perfect for the production, fitting the various scenes effortlessly whilst capturing the feel, style and energy of the 1950s, no doubt aided in part by John McDaniel's musical arrangements and the musical direction of Greg Arrowsmith who leads an excellent band. "Pink's In Town", "The Famous Bronze", "What I Dreamed Last Night" and "Dancing On The Moon" are particular standouts. The integration of the TV show's famous title song is also well handled and never feels unnatural when it appears. Andrew Wright's choreography is a little underwhelming in places, lacking energy especially in the Act I lull, but picks up in the second act where everything seems to come together. His direction is also a little too safe at times for my liking and there are some staging issues which need to be addressed to make them more visible to some of the audience. Some of his transitions between scenes should be looked at and he needs to deal with the sagging within Act I. It's to his credit, however, that Act II is far superior and brings the show up to a whole new level, bringing the audience with it. It's a zippier and cleaner affair than Act I. 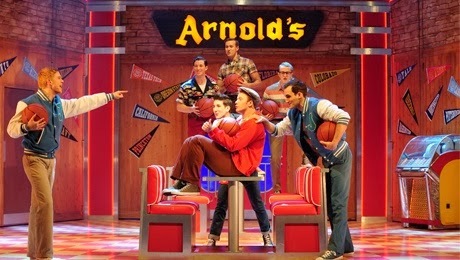 The design by Tom Rogers is also a little hit and miss: Whilst his costumes are spot on his set, which is based on a unit set of "Arnold's Diner" that has folding walls to become other sets (such as the "Cunningham's House"), can sometimes become clunky during transitions. The design also seems to limit some of the action that takes place on it - no more is that present than when we visit the "Cunningham's Back Yard" and the exterior of "Fonzie's" residence; the action takes place extreme Stage Left which must surely inhibit some audience sight lines. Other times, however, Rogers' set exudes the perfect sense of nostalgic reverence and "picture perfect" images - especially when it folds in on itself to become "Franklin Park". There are also some issues with the set that need to be addressed as it often threatened to outshine the cast in its performance with doors that kept opening of themselves, whilst the efforts by cast and stage crew to close them elicited some of the strongest laughs of the evening. Philip Gladwell's lighting compliments the set for the most part but could be even more exciting in places. There were also some issues with the sound at the beginning of the evening where some lyrics were somewhat inaudible but this was rectified as Act I progressed. The true stars, aside from Williams' songs, are the cast. Anzel and her creative team have assembled an energetic and joyous ensemble that anchor the production with Ben Freeman leading the way. 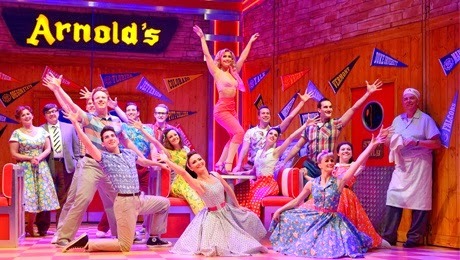 He seems quite at home as "The Fonz" bringing an easy presence and strong vocal to the role whilst Heidi Range as "Pinky Tuscadero" brings a cool sassiness to the role, not to mention a sultry voice that is a welcome contrast to the other female voices in the cast. James Paterson as "Mr Cunningham" and Cheryl Baker as "Mrs Cunningham" are perfectly cast and "Bucks Fizz" fans will not be disappointed in the latter's performance! Emma Harrold as "Joanie Cunningham" and Scott Waugh as her brother, and quasi-narrator, "Richie Cunningham" are also strong. But it is Andrew Waldron as "Ralph Malph" who threatens to steal the show with what is, probably, the funniest performance of the cast. The remaining members of the company are all well chosen and every single person onstage appears to be having a good time - even whilst fighting the misbehaving set. Amy Anzel has stated that she hopes to take this production into London's West End and her dogged nature makes you want it to happen for her, she appears so likeable. But there are certainly issues to be addressed within the current production, issues that an unforgiving West End audience will not tolerate. That said, I have no doubt that miss Anzel and her team will continue to work at the production and, who knows, she may defy the odds and succeed in her goal. After all, as she opines in her opening speech, there are far too few new musicals opening these days, and this is, ultimately, an enjoyable one. 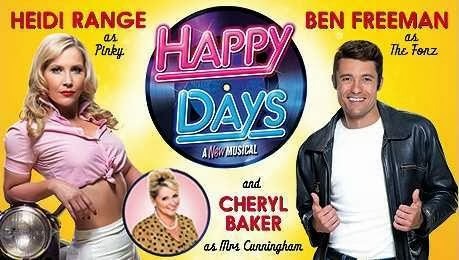 Happy Days is at the King's Theatre until 1st March.